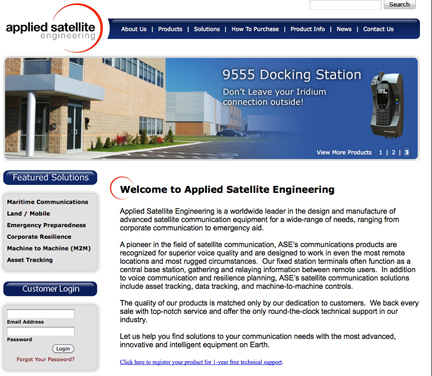 [SatNews] Applied Satellite Engineering (ASE) has unveiled their SatChat Program for Windows(tm) as a powerful enhancement for the Iridium 9555 satellite phone. ASE SatChat is a simple, yet powerful chat, email, and instant message Windows™ program for the Iridium 9555. By connecting the Iridium 9555 to a Netbook or PC, ASE SatChat leverages the short message service (SMS) and email feature of the Iridium 9555 phone to transform it into a powerful text-based, email communication platform, without the need for a dial-up or Internet connection. All messages are routed directly through the Iridium 9555 phone as a standard SMS and standard Iridium SMS charges apply. ASE SatChat allows “chat” communications that work with marginal signal strength or coverage — users can create messages from indoors or when the Iridium 9555 phone is not attached to take advantage of later delivery (or receipt). Messages can be queued up when a satellite connection is present or even when it is not. The program also enhances the Iridium 9555’s mobile communications capabilities in suboptimal locations where there is no direct line-of-sight to a satellite such as outdoor settings where mountains, trees, buildings or canyons offer limited views to the sky. ASE SatChat also bridges geographical divides by enabling ongoing communications with co-workers, clients, and friends who may span across multiple time zones. The platform also allows for continued communication in noisy environments where heavy machinery or alarms associated with construction, natural resource exploration, or emergency relief efforts would make voice calls difficult to sustain. Multiple color-coded chat windows, and group chats and broadcasts, are managed easily from the Netbook or PC interface. The program also works with all of ASE's powerful and feature-rich docking stations and Comcenter II fixed station terminals.